Home Articles Quick Tips, Guides & DMV Basics Do I Need to Wear a Helmet on My Motorcycle? Do I Need to Wear a Helmet on My Motorcycle? Remember when your mother told you helmets were cool because they save lives? Helmets are uncool, because the essence of cool is just not giving a damn, and by wearing a helmet you are showing that you do indeed care about the contents of your cranium. 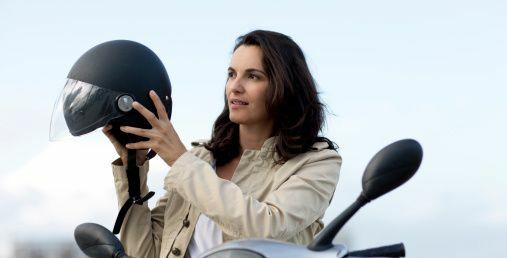 Square as that may be, having a working brain is awesome, and helmets - in theory, at least - keep your melon protected from all the life changing trauma a motorcycle accident invites. Guess what else? Some states require you to wear one, and not just on when you're on a motorcycle, but also when you ride a scooter and motorized bike (or moped), as well. Three states (Iowa, Illinois, and New Hampshire) have no helmet laws at all, but every other state has a helmet law of some sort. Plenty of states require everyone to wear a motorcycle helmet, and states that don't have mandatory helmet laws for all do require motorcycle riders younger than a certain age (17, 18, and 20, depending on the state) to wear a helmet (probably due to the lobbying of moms). Check out our page on motorcycle licensing to determine your state's helmet laws. Helmet requirements for other types of bikes like motor-driven cycles, mopeds, and scooters vary from state to state, as do laws requiring bike helmets, though in all states those requirements only apply to minors riding bicycles. Texas used to have a law that required anyone riding a motorcycle without a helmet to also carry a minimum of $10,000 worth of insurance for injuries incurred in a motorcycle accident to excuse himself or herself from the requirement of wearing a helmet. That requirement went out the window in 2009, when Governor Rick Perry signed Senate Bill 1967 into law. Check with your state about any insurance issues related to wearing (or not wearing) a helmet. You can also access motorcycle insurance info and requirements in our Insurance Center. That same senate bill above also made it illegal for cops to pull over helmetless riders for the sole purpose of determining whether or not the person had successfully completed a motorcycle operator training and safety course. While helmet laws vary by state, it's worth checking if safe-rider course completion earns you the right to ride without a helmet. Yet, it also made it a requirement that a person seeking to obtain a motorcycle license complete a safety course. The Motorcycle Safety Foundation offers safe-riding courses you can check out online. Check with your DMV or motorcycle manual about motorcycle safety course requirements and helmet laws. Do you prefer riding with or without a helmet, and why? Share your comments below.